You’ve got to wonder, why would anyone ever want to move here? And once they get here, why would they ever want to stay? But it’s not all doom and gloom. My skills are improving every day, and Raul — aka the Mad Bombardier — and I have never been happier. That is, until my first solo job is interrupted by a mysterious woman who tells me that Raul has been kidnapped by a ruthless new Villain. The only way to free him is to do a job for Maggot, a man with scary ideas and an even scarier superpower. These two novellas definitely belong together, being the first and second parts of Edward and Raul’s story. Each has a complete story arc, but the second is definitely better for having read the first. Usually we get things from the Hero's perspective, but the Villains often have more interesting things to say. Edward’s our POV character, and at first he’s just a normal guy, new to town, who’s an innocent bystander sucked into the action between Villain and Hero because he’s standing where the money is, in a bank. As the fallout from his ordeal progresses, he gets to know Raul on a personal level, and begins questioning all he’s been told about this strange city where super-powered people duke it out for truth, justice, and television ratings. Edward does a little math, which gets him questioning how and why this public mayhem is not only tolerated but encouraged. There’s a very dirty underbelly to the rivalry, and the running commentary from the mysterious SuperTruther points out some of the ideas Edward is groping toward from ground zero. 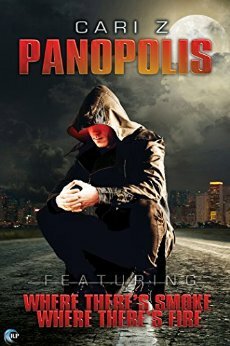 Because oh my goodness, Panopolis is one fucked up place, where the corporations run amok in people’s lives and maybe only the “bad guys” have the right idea. They certainly have enough flash to attract the train wreck of Hero attention, at which point things really go to hell. While Edward is feeling his way toward his place in this urban jungle, he meets Freight Train, the Hero of Where There’s a Will, reviewed here. Freight Train’s starved for affection, and tries courting Edward, a situation bound for trouble, because Edward can’t admit to being involved with the Mad Bombardier. Trouble from Book One catches up to Edward and Raul in Book Two, and here’s where reader squeamishness and the story don’t mesh well. There’s a graphic and horrible event, and even at one remove, it was really stomach turning. It went from a kind of comic book violence to something much, much too real. I had to put the book down and go for a walk, and only my trust in this author made me finish. The aptly named Maggot is only one of the Villains Panopolis offers. The story isn’t over, in this town where manufactured superheroes and their equally manufactured worthy enemies fight and keep the attention from far worse doings. Maybe SuperTruther will get a story? I can’t separate ratings for the books because they’re so entwined in my head but even with the need to drop the Kindle like a poisonous snake there for a minute, this was a good read.